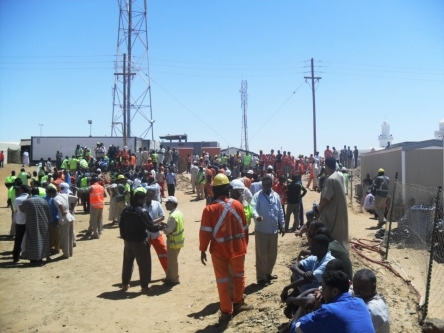 The miner's union, the General Confederation of Mauritanian Workers (CGTM) reports that 1,500 workers staged a sit-in at the Tasiast mine during the strike, bringing all production to a halt. This is estimated to have cost Kinross, the Canadian firm who own the mine, around $43,300 per hour. The miners raised 21 separate demands relating mostly to their poor working conditions, but the unfair dismissal of their colleague Mohamed Vall Ould Merzough after he took time off sick provided the catalyst for the action. Mohamed Vall Ould Merzough has been reinstated, and a committee is now in place to review the cases of all dismissed workers. The workers have signed an agreement with the company, who have agreed to consider the 50% pay increase demanded by the workers, as well as the provision of full health insurance. The agreement also covers improvements to the on-site clinic and the establishment of a pharmacy, and the provision of mineral water for workers. The miners will also receive bonuses of around 2months salary every six months. The CGTM says further strikes and mobilisations will occur if Kinross does not honour the strike agreement. One of the demands made by striking workers was for "Mauritanization" of recruitment, which the CGTM explains as increasing the number of Mauritanian workers at the site and decreasing the number of expatriate workers - Mauritania has one of the highest unemployment rates in the world, and mining jobs are highly sought after, with people coming from across Africa to work here. This demand, in amongst a list of otherwise straightforward demands, is obviously very worrying. "This demand, in amongst a list of otherwise straightforward demands, is obviously very worrying." The language used isn't ideal I agree but could you tell me how prominent that demand was in the strikes pickets and protests? Also what exactly does the term "Mauritanization" mean to the striking miners did they ever elaborate? Was it a "no foreigners" apply demand, or a qualified locals get first preference with outside sources used to top up shortfalls? If it was just another motion added to the list it shouldn't be too troubling. It could just mean that they're worried about companies using cheaper outside labour to keep unemployment high and weaken workers leverage. Though the language and the potential "solution" it implies is far from ideal.